This document is a copy of the manor court roll entry for the sale of a piece of copyhold land. Every transfer of copyhold property in Winslow would have been recorded in a similar way since the Middle Ages. The vendor surrendered the land and seizin was granted to the purchaser. The purchase price is not usually mentioned, but a small "fine" was payable to the lord of the manor. The document is summarised below; the part in "..." is the full text, with some punctuation added. Click here for an image of the whole document. Manor of Winslow. View of Frankpledge with Court Baron of William Selby esq. on 27 and 29 October 1806 before Robert Langley Appleyard, Gentleman, Steward. "All those two undivided Moieties or half parts (the whole into two equal parts being divided) of and in All that Close or Pightle of Pasture Ground situate and being in Winslow aforesaid called or known by the name of the Pightle and formerly belonging to and adjoining the Messuage or Tenement heretofore of Robert Crockett deceased, late in the Tenure or Occupation of Thomas Morecraft and now of John Cowley, with the Appurtenances. To which said undivided Moieties respectively the said Henrietta Tookey was admitted Tenant at two General Courts holden in and for this Manor on the Twenty ninth day of October 1789 and the Twenty eighth and Twenty ninth days of October 1796." 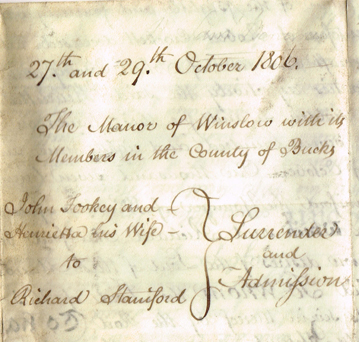 To the use of Richard Staniford the Younger of Winslow, Bricklayer, who desired to be admitted Tenant. Seizin was granted to him; yearly rent 3½d; fine 1s; fealty respited. Thomas Prentice of Winslow, surgeon and apothecary, in his will made in 1775 and proved in 1780 (National Archives PROB 11/1060/32) left all his copyhold land in Winslow to his daughter Mary Ann Prentice for her life. If she died without children, it was to go to his other surviving children as tenants in common. He left his property in Little Horwood to his daughter Henrietta Prentice and most of his property in Stewkley to his son Thomas Eagles Prentice under the same terms. At the 1780 manor court, Mary Ann (aged 14) was admitted as tenant to (among other things) a close of pasture called the Pightle formerly belonging to or adjoining the messuage of Robert Crockett deceased late in Thomas Prentice's occupation. Henrietta must have acquired the property in this document in 1789 after her sister died and 1796 when her brother transferred his share to her. She married John Tookey, who came to Winslow as a surgeon in 1773, on 24 Sep 1796. He died in 1817. Henrietta moved to Hemel Hempstead and died in 1847. Richard Staniford lived at Staniford House, at the corner of Greyhound Lane and the High Street. His father Richard Staniford senior died in 1814. The Stanifords were Winslow’s main brickmakers at this time. The probable location of the land in the document is shown in blue superimposed on the 1880 map (right). This land was allotted to Robert Crockett at enclosure in 1767. It was just under half an acre (1r 32p), described as “bounded on the east by the said Turnpike Road leading from Winslow to Buckingham aforesaid on the south by the garden of the said Robert Crockett and on the west and north by the allotment of the said John Budd”. At a special manor court on 25 May 1773, it was recorded that Robert Crockett of Winslow, mason, by his will of 2 Aug 1773 left his messuage and 2 little pieces of ground adjoining known as the Pightle to his wife Mary and son William Crockett. They were admitted at court on 31 Oct – 1 Nov 1770. William was since dead, Mary surviving. Now she surrendered the new inclosed close now in the occupation of Thomas Prentice, late of Samuel Yeates, containing 2r 13p (presumably some of the garden had been added to it) to the use of Thomas Prentice, surgeon and apothecary. The land was south of where Avenue Road joins the High Street now, and it became attached to Richard Staniford’s property known as Brick-Kiln Norden. The land went from being used as pasture to brick production. Later it was acquired by Samuel Boneham of Thornborough, brickmaker. He built 89-115 High Street and the Royal Engineer on the northern part. He sold off the southern part in 1845 to (among other) Richard Gibbs brickmaker who bought a plot of 33 x 12 yards on which he built 87 High Street (1845-6 manor court). The document also shows that there was a house (“the Messuage or Tenement heretofore of Robert Crockett deceased”) on the west side of the High Street north of Vicarage Road by the mid-18th century. This later (1841) became the premises of the Sear family of coachmakers.